Plan your next birthday, anniversary or work dinner at Dosa. Please allow us to help you create an enjoyable, personalized and successful event. DOSA provides a stunning and versatile space that offers dining experiences for a wide array of occasions from casual gatherings to formal wedding receptions. 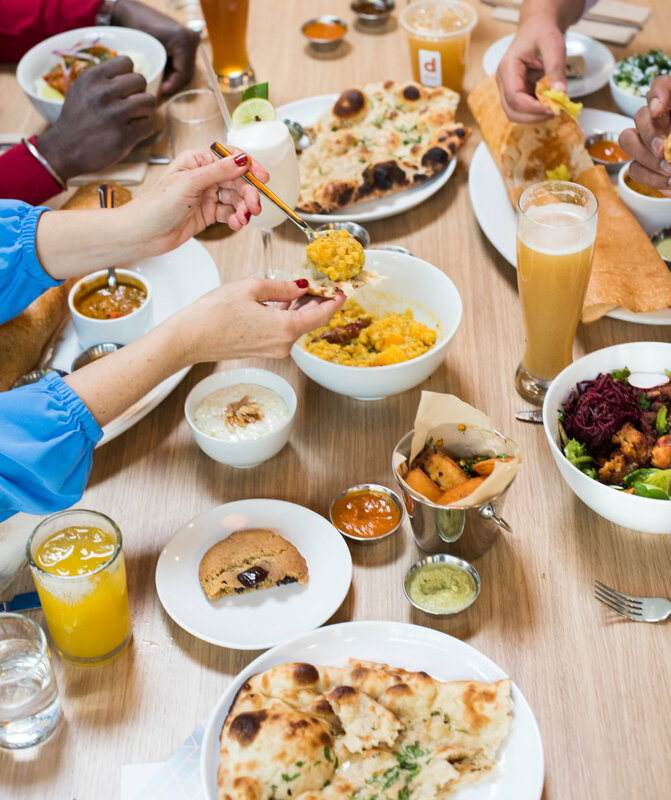 Depending on your preferences, group needs, and the number of guests, DOSA offers many flexible dining and event options that can be easily customized for groups as small as 16, to as large as 250 people! Please select a location and our coordinator will be in touch. Orders for pickup during business hours can be placed by email to catering@dosasf.com with 72 hours notice and will be packed in biodegradable or recyclable containers. We can deliver our menu items to your home, office or event venue with 72 hours’ notice. Delivery is generally available between 11:30 a.m. and 7 p.m. A minimum order of $250 is required to have delivery as an option within the San Francisco city limits, orders delivered outside of San Francisco require a minimum order of $500. Otherwise, you will need to arrange for pick up. Delivery pricing is based on location and will be quoted when you place your order. For passed hors d’oeuvres, count on about 2-3 pieces/items per guest per hour. You can call us at 415-819-3672 or email catering@dosasf.com with your order. We require a credit card number to guarantee the order. If you are picking up, pre-payment by credit card expedites the process and will get you on your way much faster. If we are delivering your order we will charge your credit card the day after the order is delivered. You may increase, decrease or cancel your order up to 48 hours prior to the pick-up or delivery time. Orders canceled with less than 48 hours’ notice will be subject to a fee of 50% of the order total. Orders canceled within 24 hours will be charged 100% of the order total. Orders will be picked up at one of either of the two DOSA locations. The pick up location will be determined at the time you place your order. DO YOU PROVIDE UTENSILS WITH PLATTERS? We provide compostable forks, knives and spoons and biodegradable plates and charge a nominal fee per setting. Please be sure to tell us what utensils you need, if any, upon placing your order. To help facilitate your event, we are happy to offer additional services such as buffet arrangement and coffee service. Charges are calculated based on the location and the services provided, and will be quoted at the time of your order. Please let us know any staffing requirements you may have. DOSA will be happy to help customize a proposal to ensure a well organized event with excellent service.